Etihad Airways , the national airline of the United Arab Emirates, and Cognizant, a leading provider of information technology, consulting, and business process outsourcing services, today announced a strategic agreement to drive digital transformation across the airline and its equity partners. Under the three-year, multi-million dollar deal, Cognizant will help Etihad Airways define its digital strategy and reimagine the guest experience along a guest’s travel journey across the group. 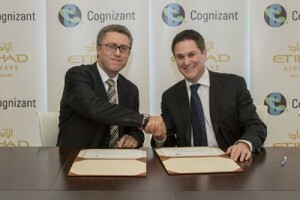 By bringing together its digital strategy, technology, industry and experiential design expertise, Cognizant will conduct a comprehensive study of Etihad Airways ‘ current business and technology footprint to outline and operationalise a best-in-class digital ecosystem, enabling multi-channel distribution, customer persona segmentation and personalised marketing techniques. Through data and customer insights, Cognizant will enable Etihad Airways , and subsequently its equity partners, to better understand the needs of their guests. Combining this research with streamlined best practices, processes and technology, the airline will provide guests with customised offerings, tailored travel solutions, and enhanced experiences throughout their journey based on their loyalty status and personal preferences such as product and service features, preferred seating, meal choices, holiday destinations and more. For the airline, this means unlocking new revenue streams, enhancing its brand and building new commercial models. As part of the engagement, Cognizant will manage Etihad Airways ‘ existing web applications and portals and integrate them into the new digital platform. A new Digital Centre of Excellence will be established to drive innovation with the airline’s key technology partners.